Recent studies have shown that excessive dissolved-solids concentrations in water can have adverse effects on the environment and on agricultural, domestic, municipal, and industrial water users. Such effects motivated the U.S. Geological Survey’s National Water Quality Assessment Program to develop a SPAtially-Referenced Regression on Watershed Attributes (SPARROW) model that has improved the understanding of sources, loads, yields, and concentrations of dissolved solids in streams of the conterminous United States. Using the SPARROW model, long-term mean annual dissolved-solids loads from 2,560 water-quality monitoring stations were statistically related to several spatial datasets that are surrogates for dissolved-solids sources and land-to-water delivery processes. Specifically, sources in the model included variables representing geologic materials, road deicers, urban lands, cultivated lands, and pasture lands. Transport of dissolved solids from these sources was modulated by land-to-water delivery variables that represent precipitation, streamflow, soil, vegetation, terrain, population, irrigation, and artificial drainage characteristics. Where appropriate, the load estimates, source variables, and transport variables were statistically adjusted to represent conditions for the base year 2000. The nonlinear least-squares estimated SPARROW model was used to predict long-term mean annual conditions for dissolved-solids sources, loads, yields, and concentrations in a digital hydrologic network representing nearly 66,000 stream reaches and their corresponding incremental catchments that drain the Nation. Nationwide, the predominant source of dissolved solids yielded from incremental catchments and delivered to local streams is geologic materials in 89 percent of the catchments, road deicers in 5 percent of the catchments, pasture lands in 3 percent of the catchments, urban lands in 2 percent of the catchments, and cultivated lands in 1 percent of the catchments. Whereas incremental catchments with dissolved solids that originated predominantly from geologic sources or from urban lands are found across much of the Nation, incremental catchments with dissolved solids yields that originated predominantly from road deicers are largely found in the Northeast, and incremental catchments with dissolved solids that originated predominantly from cultivated or pasture lands are largely found in the West. The total amount of dissolved solids delivered to the Nation’s streams is 271.9 million metric tons (Mt) annually, of which 194.2 million Mt (71.4%) come from geologic sources, 37.7 million Mt (13.9%) come from road deicers, 18.2 million Mt (6.7%) come from pasture lands, 13.9 million Mt (5.1%) come from urban lands, and 7.9 million Mt (2.9%) come from cultivated lands. Nationwide, the median incremental-catchment yield delivered to local streams is 26 metric tons per year per square kilometer [(Mt/yr)/km2]. Ten percent of the incremental catchments yield less than 4 (Mt/yr)/km2, and 10 percent yield more than 90 (Mt/yr)/km2. Incremental-catchment yields greater than 50 (Mt/yr)/km2 mostly occur along the northern part of the West Coast and in a crescent shaped band south of the Great Lakes. For example, the median incremental-catchment yield is 81 (Mt/yr)/km2 for the Great Lakes, 78 (Mt/yr)/km2 for the Ohio, and 74 (Mt/yr)/km2 for the Upper Mississippi water-resources regions. Incremental-catchment yields less than 10 (Mt/yr)/km2 mostly occur in a wide band across the arid lowland of the interior West that excludes areas along the coast and the extensive, higher mountain ranges. For example, the median incremental-catchment yield is 3 (Mt/yr)/km2 for the Lower Colorado, 5 (Mt/yr)/km2 for the Rio Grande, and 8 (Mt/yr)/km2 for the Great Basin water-resources regions. Predicted incremental loads were cascaded down through the reach network, with loads accumulating from reach to reach. For most stream reaches, the entire incremental load of dissolved solids delivered to the reach was transported to either the ocean or to one of the large streams flowing along the U.S. international boundary without losses occurring along the way. The exceptions to this include streams in the southwestern part of the country, such as the Colorado River, Rio Grande, and streams of internally drained drainages in the Great Basin, where dissolved-solids loads decreased through streamflow diversion for off-stream use, or by infiltration through the streambed. Long-term mean annual flow-weighted concentrations were derived from the predicted accumulated-load and stream-discharge data. Widespread low concentrations, generally less than 100 milligrams per liter (mg/L), occur in many reaches of the New England, South Atlantic-Gulf, and Pacific Northwest water-resources regions as a result of moderate dissolved-solids yields and high runoff rates. Widespread moderate concentrations, generally between 100 and 500 mg/L, occur in many reaches of the Great Lakes, Ohio, and Upper Mississippi River water-resources regions. Whereas dissolved-solids yields are generally high in these regions, runoff rates are also high, which helps moderate concentrations in these regions. Widespread higher concentrations, generally greater than 500 mg/L, occur across a belt of reaches that extends almost continuously from Canada to Mexico in the Midwest, cutting through the Souris-Red-Rainy, Missouri, Arkansas-White-Red, Texas-Gulf, and Rio Grande water-resources regions. Although dissolved-solids yields are moderate to low in these areas, low runoff rates result in the high concentrations for these areas. In 12.6 percent of the Nation’s stream reaches, predicted concentrations of dissolved solids exceed 500 mg/L, the U.S. Environmental Protection Agency’s secondary, nonenforceable drinking water standard. While this standard provides a metric for evaluating predicted concentrations in the context of drinking-water supplies, it should be noted that it only applies to drinking water actually served to customers by water utilities, and it does not apply to all stream reaches in the Nation nor does it apply during times when water is not being withdrawn for use. Exceedance of 500 mg/L is more pronounced in certain water-resources regions than others. For example, about half of the reaches in the Souris-Red-Rainy region have concentrations predicted to exceed 500 mg/L, and between 25 and 37 percent of the reaches in the Missouri, Arkansas-White-Red, Texas-Gulf, Rio Grande, and Lower Colorado regions are predicted to exceed 500 mg/L. Development of stream-load data for use in the SPARROW model also provided long-term temporal trend information in dissolved-solids concentrations at the monitoring stations for their period of record, which was constrained between 1980 and 2009. For the 2,560 monitoring stations used in this study, long-term trends in flow-adjusted dissolved-solids concentrations increased over time at 23 percent of the stations, decreased at 18 percent of the stations, and did not change over time at 59 percent of the stations. Long-term trends show a strong regional spatial pattern where from the western parts of the Great Plains to the West Coast, concentrations mostly either did not change or decreased over time, and from the eastern parts of the Great Plains to the East Coast, concentrations mostly either did not change or increased over time. Results from the trend analysis and from the SPARROW model indicate that, compared to monitoring stations with no trends or decreasing trends, stations with increasing trends are associated with a smaller percentage of the predicted dissolved-solids load originating from geologic sources, and a larger percentage originating from urban lands and road deicers. Conversely, compared to stations with increasing trends or no trends, stations with decreasing trends have a larger percentage of the predicted dissolved-solids load originating from geologic sources and a smaller percentage originating from urban lands and road deicers. Stations with decreasing trends also have larger percentages of predicted dissolved-solids load originating from cultivated lands and pasture lands, compared to stations with increasing trends or no trends. 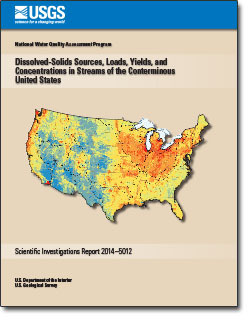 Anning, D.W, and Flynn, M.E., 2014, Dissolved-solids sources, loads, yields, and concentrations in streams of the conterminous United States: U. S. Geological Survey Scientific Investigations Report 2014-5012, 101 p., http://dx.doi.org/10.3133/sir20145012.